I have partnered with Raymour & Flanigan and received products in exchange for this post. As always, all opinions are my own. Even though the kids are getting bigger, they are very much still adamant about room-sharing (and phew! because right now they don’t have a choice.). It’s all they’ve ever known and happens to be the norm among friends living in smallish spaces here in New York City. These two certainly squabble, but I do think that sharing a room has fostered a unique closeness, a penchant for creative play, and a desire to seek new discoveries and adventures together. 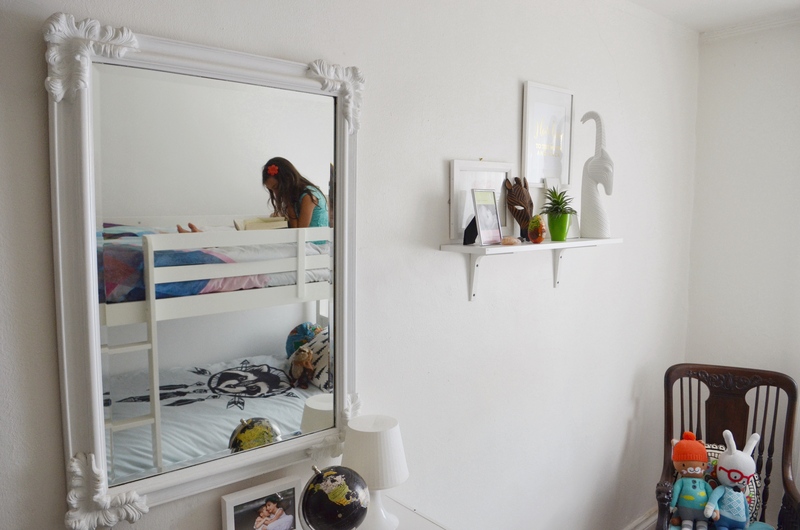 With a new school year approaching, we were determined to make their shared bedroom as functional as possible with a space saving and equitable design. 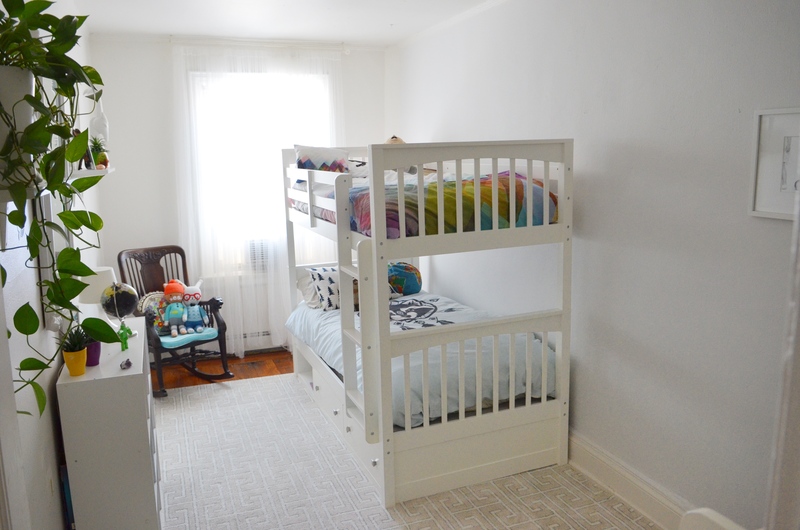 The room was previously overrun by big sister and had a feminine pull despite adding personalized touches for the little guy. 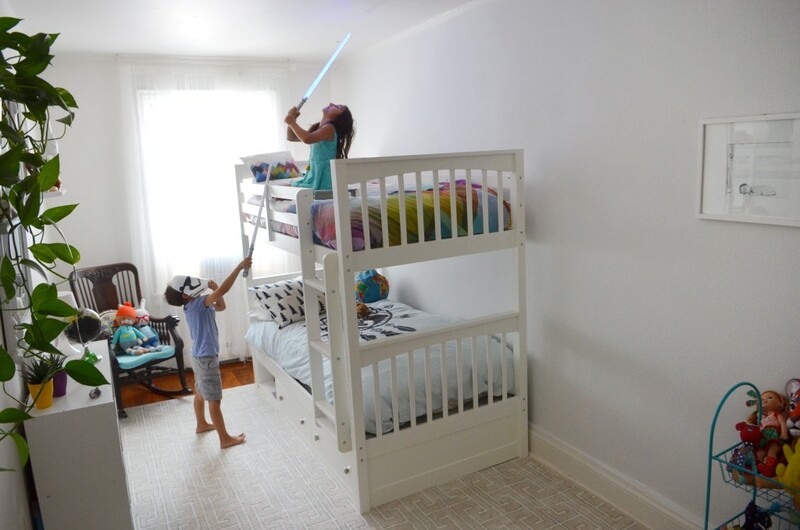 The kids have been keen on getting bunk beds for a while now, and we’re so pleased with the Jordan Bunk Beds we ultimately decided on from Raymour & Flanigan. 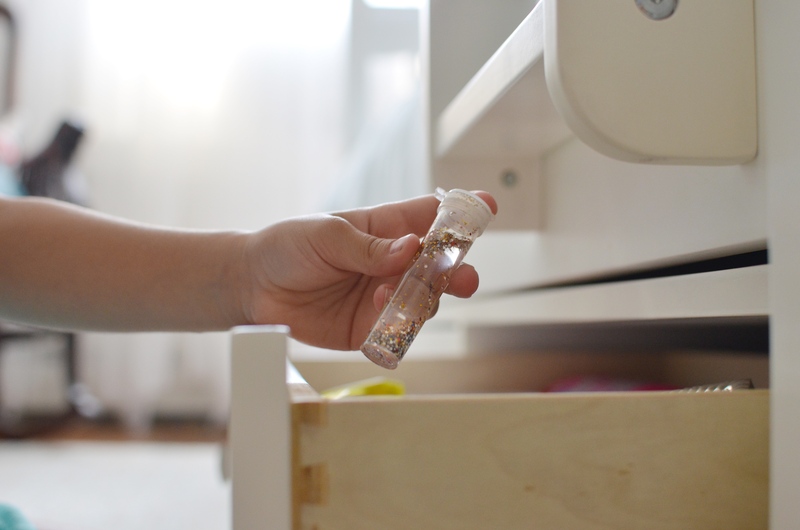 With two built-in storage drawers (trundle or open options are available too), both kids quickly stuffed their prized possessions into their designated drawers (coined their, “collections”). Although I envisioned tucking clothing options for the school week into the bunk bed drawers, their “collections” became the solution for housing those special (and random) nick-knacks in a centralized location. The additional single cubby stores their current reads and library books and other ever-changing methodically placed toys that make me appreciate my children’s inherent creativity; the sort of evidence of living a vibrant life with kids. After falling in love with an online exclusive item (a beautiful rug!) I almost placed the entire order online, but I’m glad we made our way into a Raymour & Flanigan showroom. It stirred up incredible kiddo excitement and in hindsight, I had a lot to learn. Who knew that bunk beds took smaller box springs than stand alone beds? And the top bunk needed a thinner mattress to prevent the top bunker from going overboard. Raymour & Flanigan has it all, and one of the best parts is that they deliver it AND SET IT ALL UP FOR YOU! The spacious Glistening Night’s Area Rug is cozy and inviting and super soft on bare feet, and definitely adds warmth to the space. 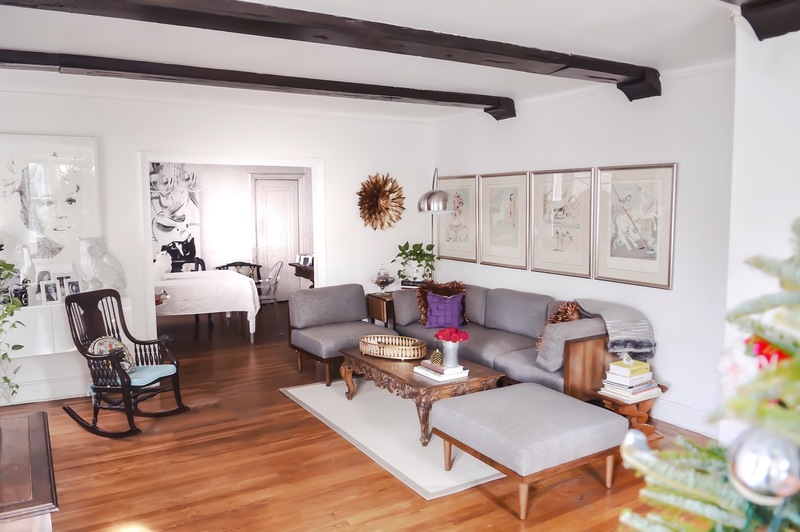 In addition to painting the walls a fresh coat of white, and undergoing massive purges throughout the summer, I learned that I had to let go of a few of my design ideas in order to create a functional space in a small home. 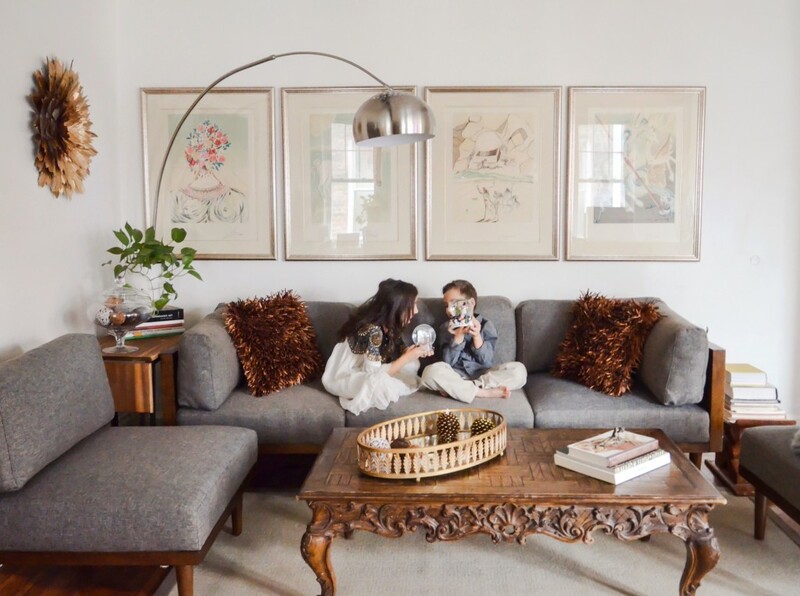 We love an eclectic mix of special family pieces in our furniture, and I had reservations about removing an ornate vintage chandelier from the kids’ room that didn’t make sense with bunk beds (or a boy/girl shared space). Adding my father’s family rocking chair to the corner and leaving my husband’s grandmother’s large mirror in the room (previously sprayed white) fulfilled the meaning that I was craving in the children’s room, reminding us of loved ones no longer with us. The room continues to feel incredibly bright and light and positive, and easy to clean up and organize. 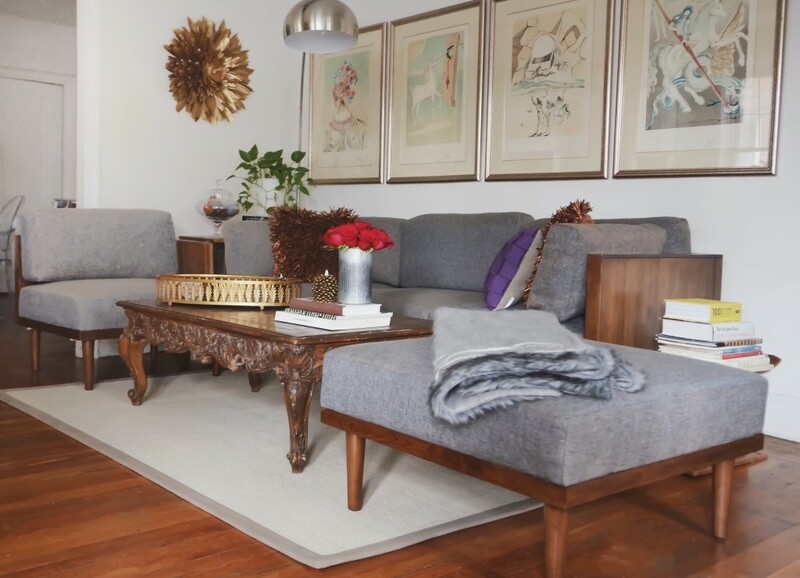 And although we were tempted to add one of Raymour & Flanigan’s options for matching dressers or night stands – the open space is utilized so well. 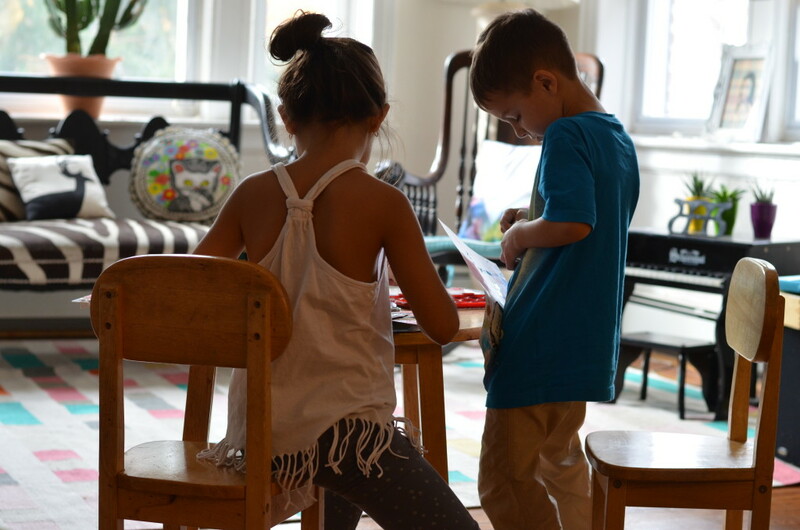 Since changing things up, we’ve found the kids naturally separating when needing a break from each other, with one in the playroom in the front of our home – and the other carrying about, on their own in the bedroom. 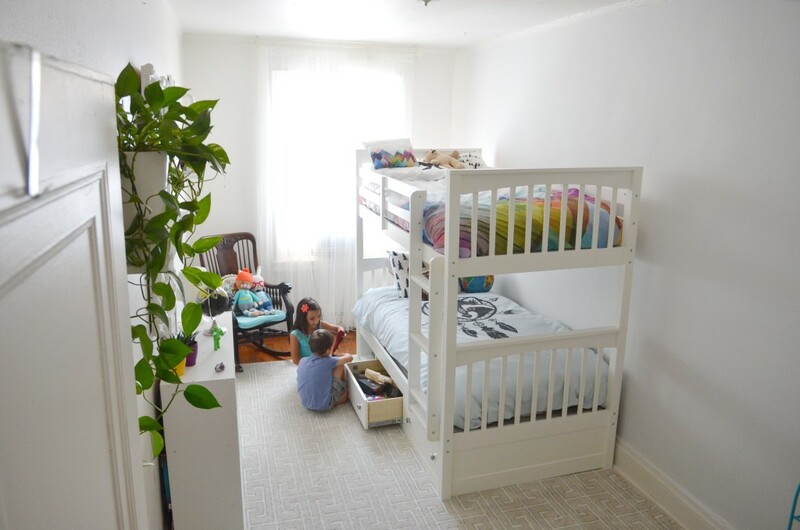 Organizationally set to approach a new school year, I can’t believe it took me this long to make much-needed changes to the children’s bedroom. 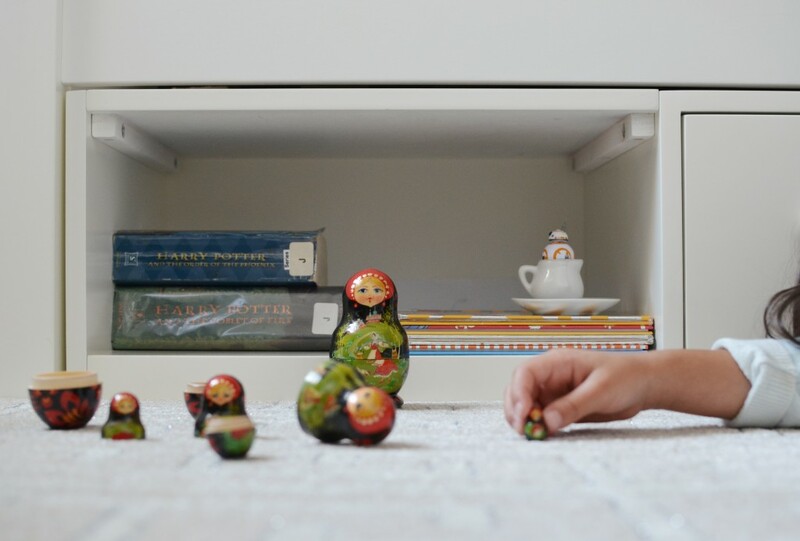 Even just a few pieces can create a massive impact with lasting effects on the entire family. We’re all so happy with the outcome and motivated to continue to make smart design changes throughout our home. Consideration provided by The Home Depot via Mode Media. There’s something to be said about stepping out of one’s comfort zone. In what almost feels like a former life, challenge was a constant. As a springboard diver; a new undergrad who took a vacation to Hawaii and didn’t get on that plane back home; a twenty-something year old who tried to conquer surfing (despite never being good at it) – the list goes on. 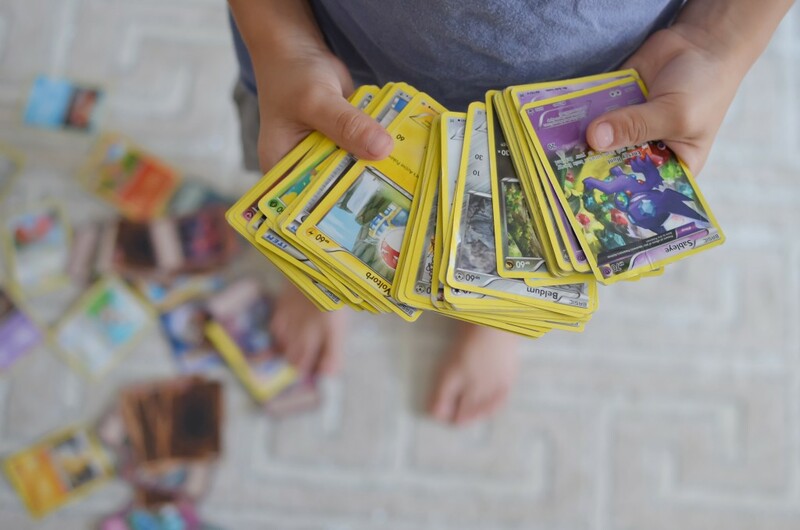 Motherhood, of course, presents a new set of mind-blowing challenges, with pieces of your heart literally running around outside of your body – that said, perhaps caution set in with the passing of years. 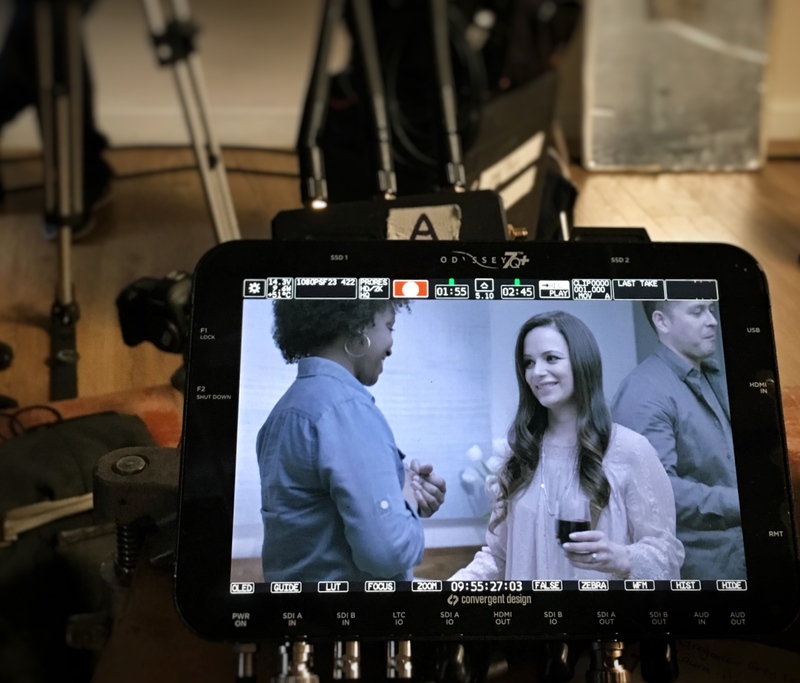 And so I’ve been trying to examine and challenge the ways in which I push myself both personally and professionally – and when an opportunity to film a commercial with The Home Depot came my way, I hung up my reservations and gave it a go. The funny thing is that as a builders’ wife I spend more time at our local Home Depot than I suppose I’d like to. I tend to discuss all brand opportunities with my husband when determining if they resonate as a good fit, and he seriously tried to sell their Pergo Outlast+ flooring to me! No persuasion needed, as the idea of leaving a spill for up to twenty four hours (without visible liquid damage) makes me want these sort of floors in my home. And just like my role in the commercial, I’m often the one to blame for the spills. Whoopsy Daisy! It’s definitely a trip to see my head pop up in the ads in my sidebar, and I’ve greatly appreciated the support among other writers who reached out to let me know that the commercial has been circulating in their website ads. 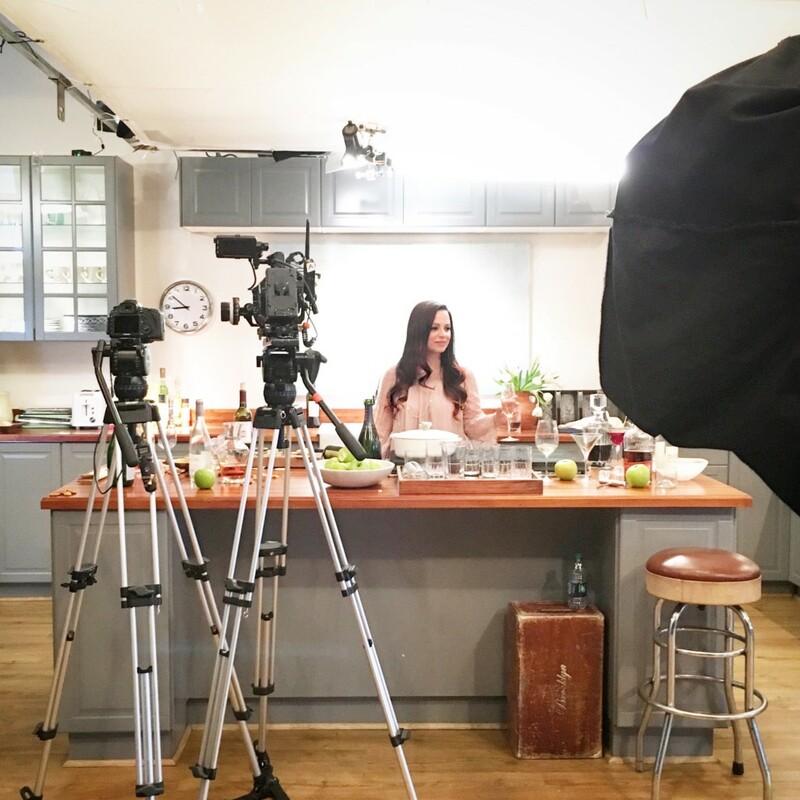 Although I’m far from Emmy material – I’m glad that I joined in this cool experience and had a look at the inner workings of production and all that goes into the filming process. It’s a ton! Thanks to team MODE and Home Depot for being so kind and supportive. Catch the full video below! Thank you for your continued support of sponsored material on Marino Bambinos. 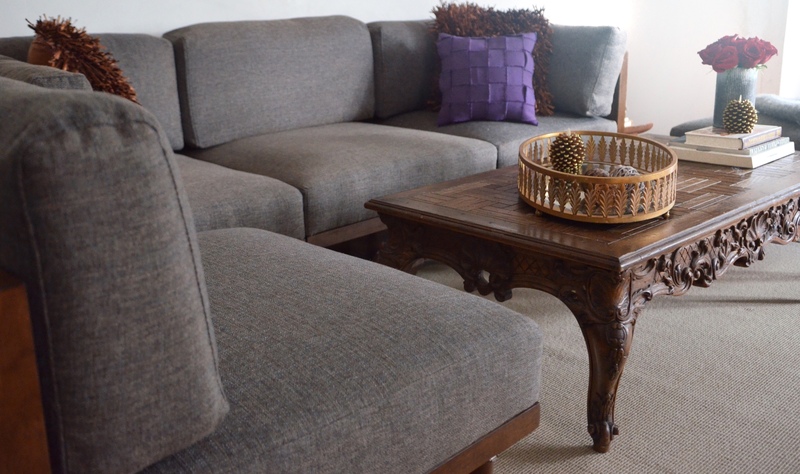 With the encumbering cold of winter behind us, spring is the perfect time to renovate or simply refresh areas of the home with interior pain. 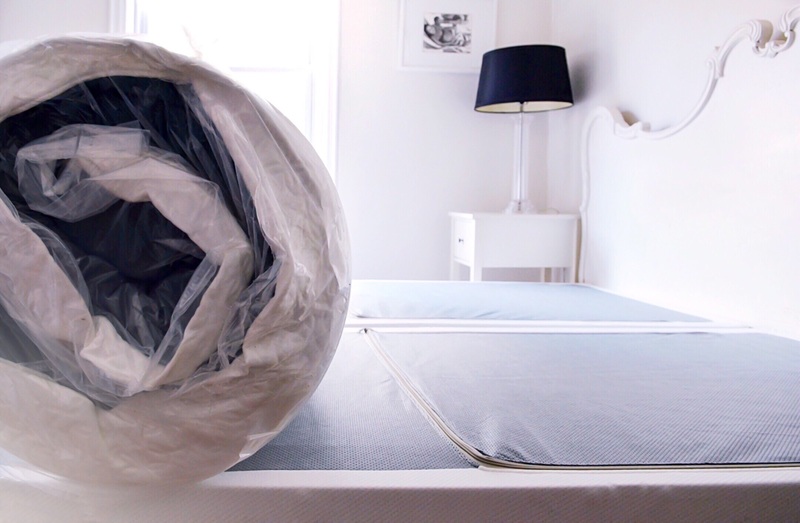 Along with the details of transforming rooms into meaningful spaces for our children and family members, comes the importance of using safe materials. That’s why I was excited to join Valspar paint and interior designer, Genevieve Gorder, in celebrating the first line of high-performing, GREENGUARD Gold Certified, Zero-VOC paints in the industry. 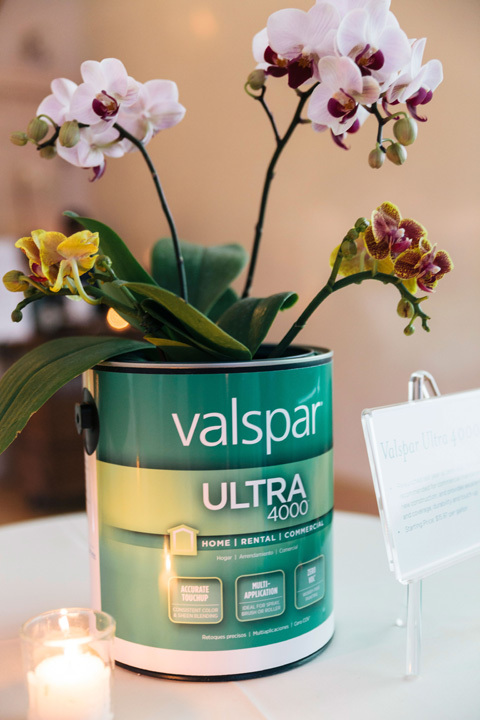 Available at Lowes, Valspar’s four product collection, (including Valspar Reserve, Signature, Ultra 400 and Ultra 200) meets the most rigorous clean air standards, allowing consumers to reduce their environmental footprint and live greener lives. It also gives parents and families peace of mind that their homes are free of harmful volatile organic compound emissions. According to the CEO of Healthy Child Healthy World, children exposed to VOCs are four times more likely to develop asthma. Exposure to VOCs has also been linked to everything from headaches and dizziness to even cancer and developmental disabilities. The Good News? 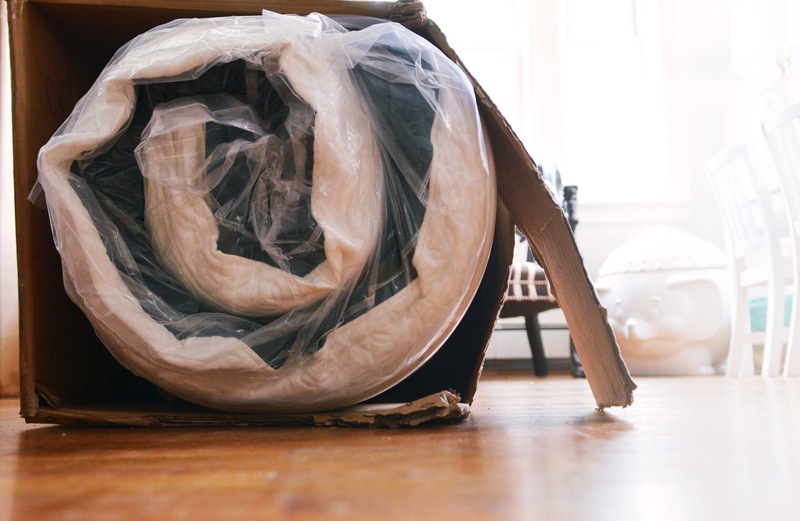 According to the EPA, limit chemical emissions in the home to secure healthy indoor air quality. Valspar’s approachable prices range from $15 to $45, make it easy to make simple choices that will make a huge difference and lasting impact on the quality of air that your family breathes. Make Every Room Special: Go beyond pretty crown molding and base molding. Try to incorporate things like a bench under a window (with secret storage!). 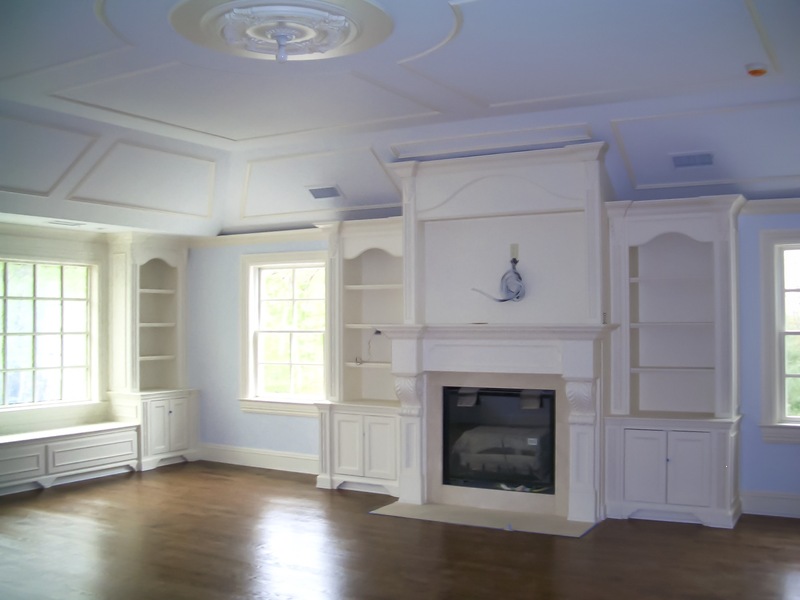 Beautiful and functional built-ins, gas-fueled fireplaces, paneling and accent walls can also make a huge impact. 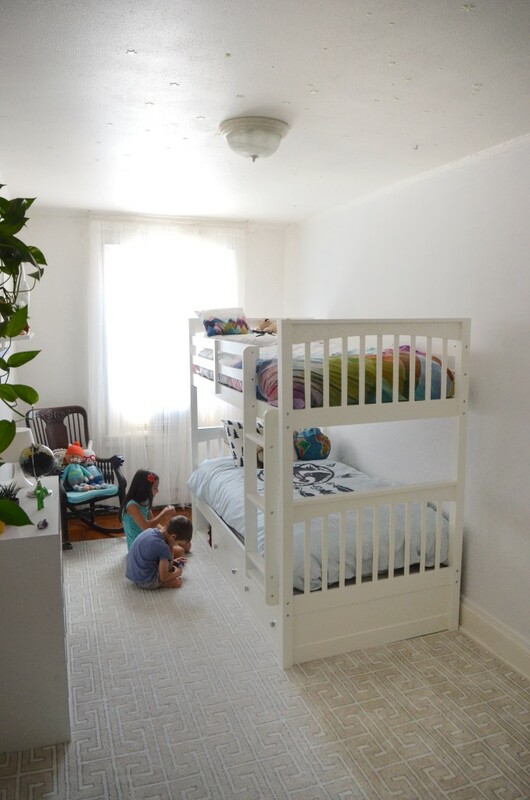 Look up: When painting a kids room, don’t just think about the walls. 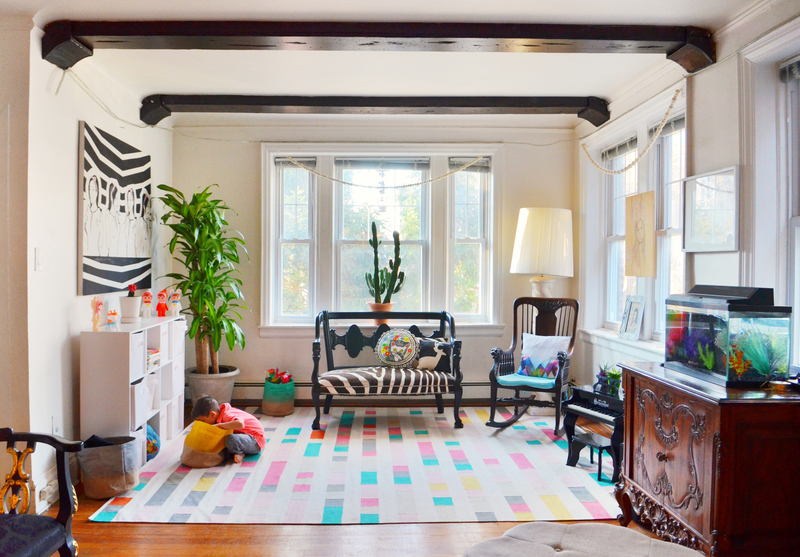 We love the painted ceiling trend in nursery and kids’ room design. Or go for an accent wall to personalize the space. Go Bold in Designated Areas: While we wouldn’t recommend painting a kitchen or great room black, by all means have fun in a powder room! Select a paint color that you wouldn’t use in any other area of the home. 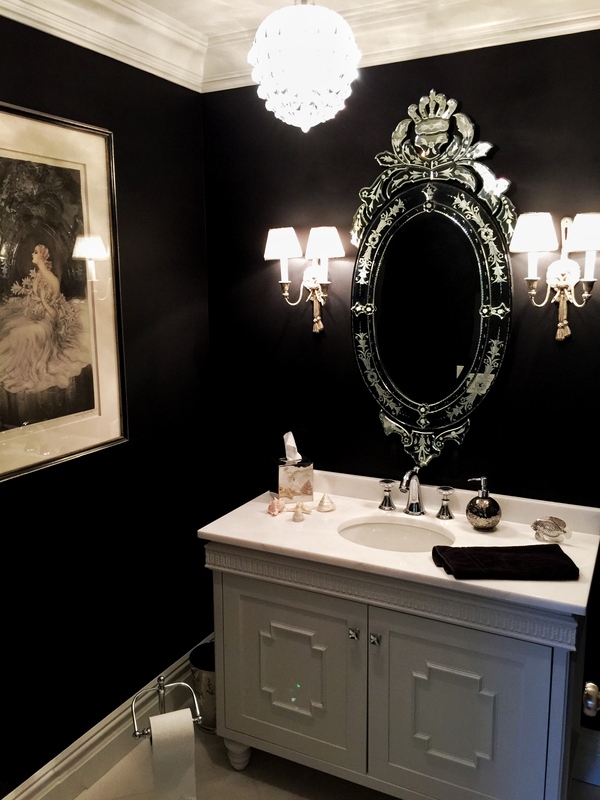 We love the resulting feel of black, dark purple and navy blue in powder rooms. Figure out Where to Save: Investing in gorgeous kitchen cabinets? Then save in other areas like the laundry room by choosing lower-priced cabinets. If working with a contractor, offer to supply finished items like tile, cabinets, paint supply, bathroom, and lighting fixtures. Selecting these products yourself will give you the freedom to price within your budget. If Unsure Test First: Light has different effects on paint color. 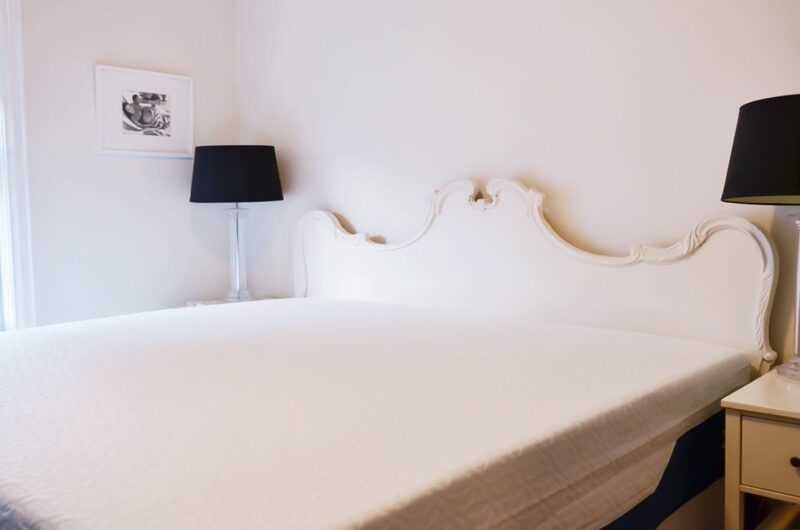 If you’re having trouble deciding between those shades of pale blue, paint a piece of white poster board and examine it at different locations in the room. 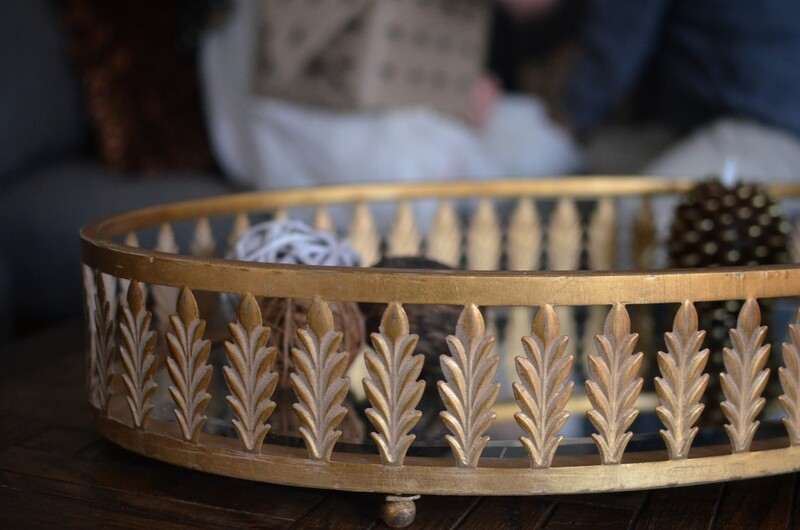 Repurpose Family Heirlooms: Consider painting granny’s gaudy gold mirror and other decorative family pieces a color that meshes with your home design and taste. 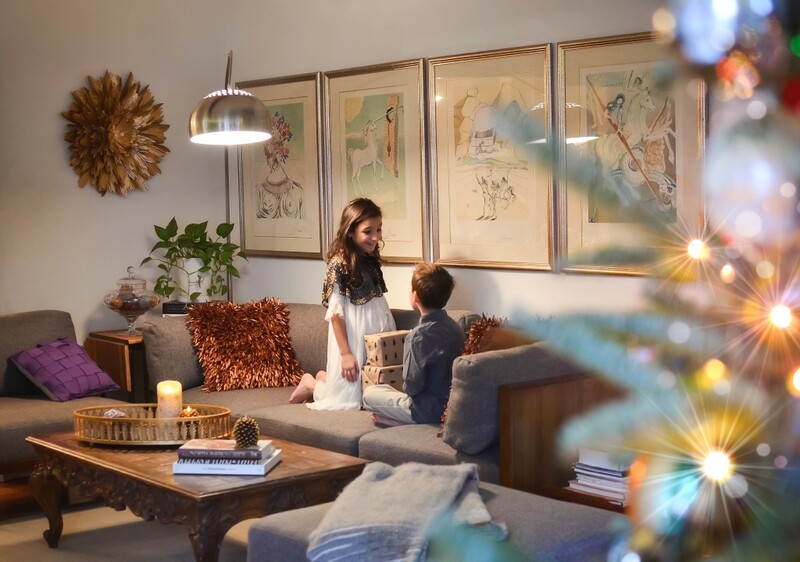 We love decorating with family pieces that carry special meaning. DIY Tip: If you are the one doing the painting you absolutely must prepare the surface. Make sure that it is immaculate by skim coating, or plastering to get rid of blemishes. Stay Safe: Remember that harmful products have the potential to off-gas long after the work is done. Valspar’s Zero-VOC line is a solid, green choice without compromising longitudinal quality. This post is sponsored by Valspar. Opinions as always are my own. Image #1 via Valspar, Images 2 – 4 via Woodside Builder LLC. We’ve always believed that our home should tell our collective family story. 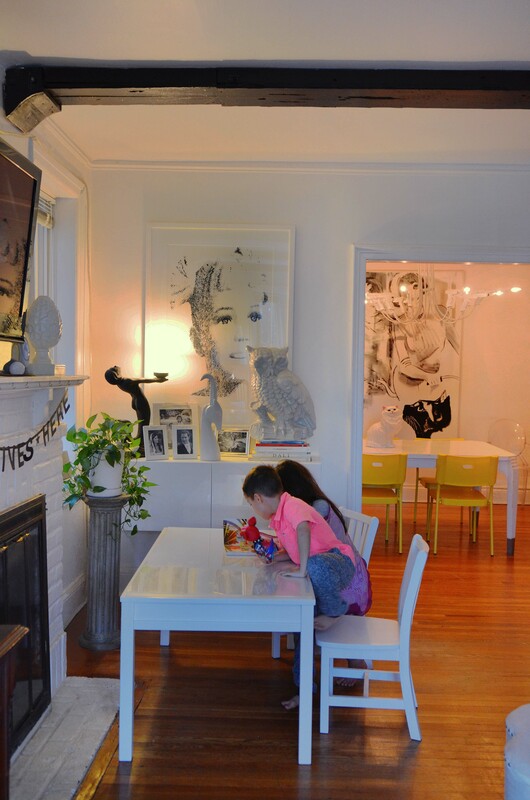 From the pencil markings on the kitchen door frame indicating the kids’ growth and passage of time to their handmade masterpieces adorning the art table display. If our walls could talk, they’d tell narratives of generations-old furniture; stripped, dipped and reupholstered to make our own. 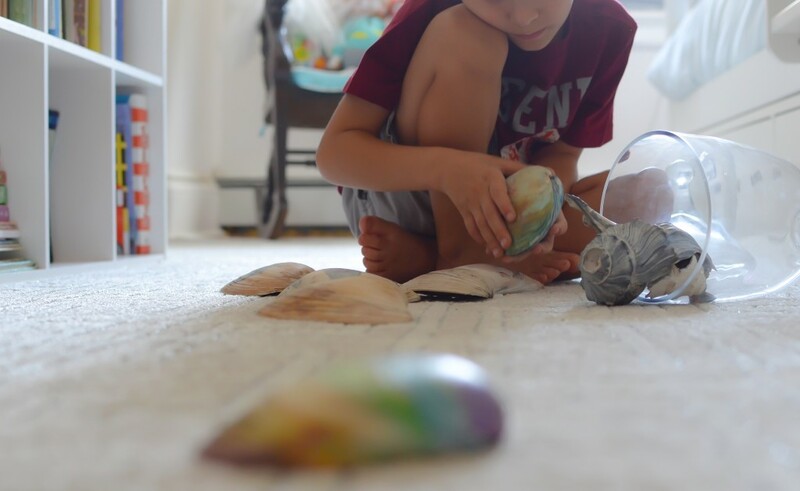 They’d speak of the artwork made by my husband showcased in nearly every room – and vestiges of a vibrant life with kids frozen in their methodologically crafted messes. We’re careful and purposeful about what we bring in, striving to make our little space a happy and eclectic mix – filled with meaning and sentiment that goes beyond our walls and a roof. Before the start of the school year, we knew that a physical change was in order. 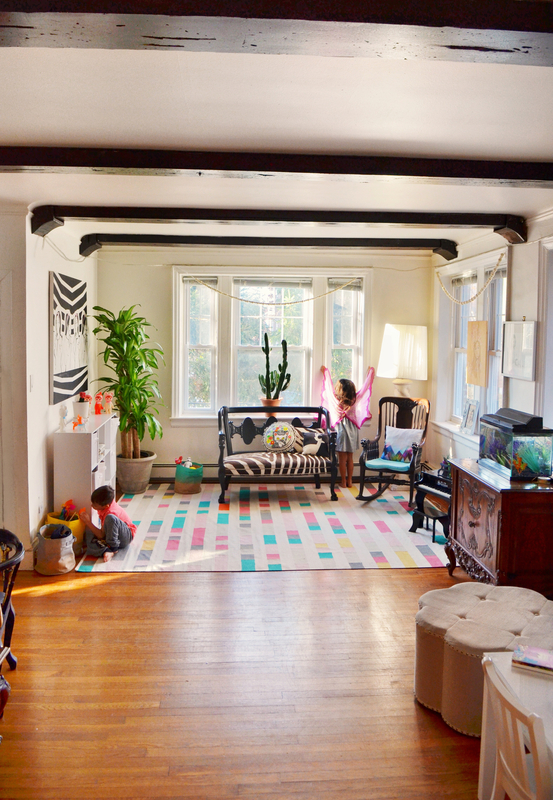 The portion of the living room dedicated to the kids grew far from functional. 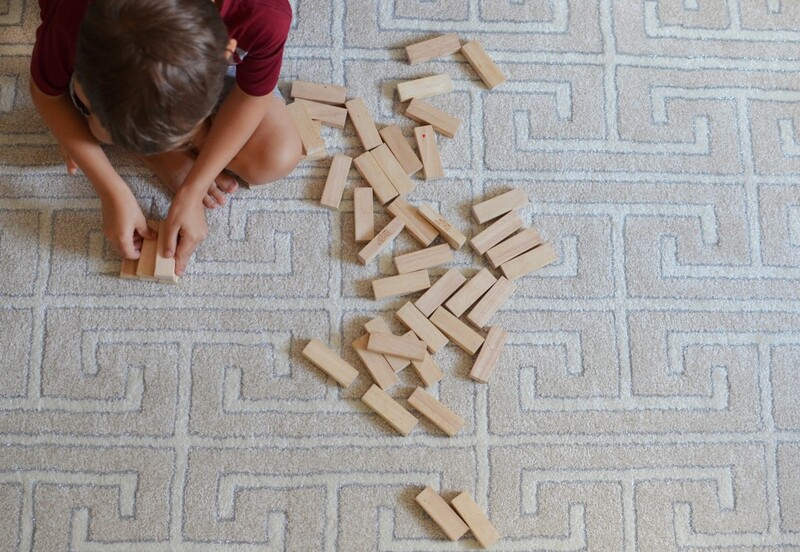 A rarely played with train table morphed into sloppy storage, and our fuax animal hide rugs had seen better days. So we donated and tossed and did our best to pare down, which wasn’t easy but made us all feel better in the long run. 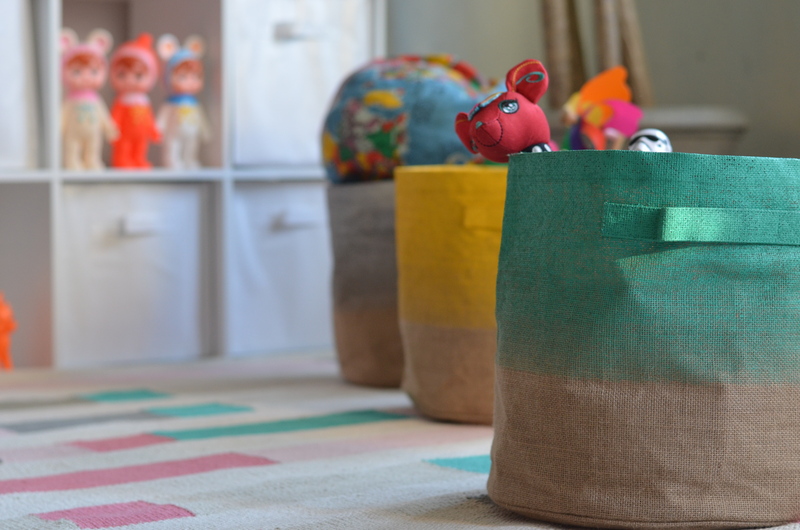 We then transformed the space back to one that inspired us to create and use our imaginations with the help of a brand who masters this – The Land of Nod. We’re all drawn to the light in the front of the house. 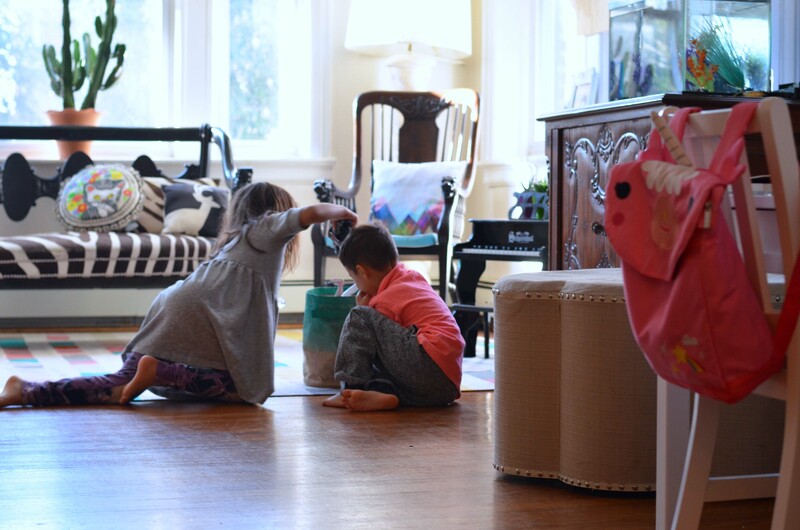 I often work from the coffee table in the far corner of the living room, while the kids play (and quarrel!) and make gargantuan messes. This is the room that gets the most action, and it’s certainly shared with much more gown-up-ish things. I’ve always admired how The Land of Nod creates kids’ furniture and decor in ways that beautifully mesh with adult spaces. 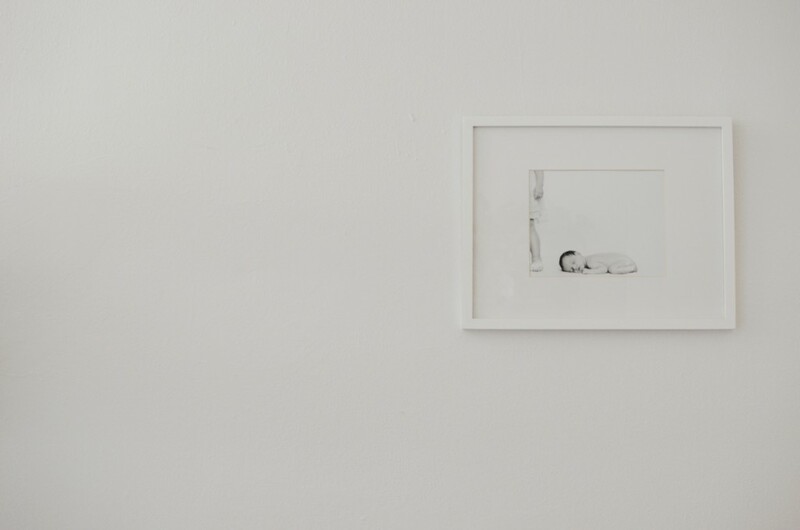 Their pieces aren’t only for closed off children’s rooms – allowing the feeling of kids and adults to simutliansly exist in thoughtful ways. 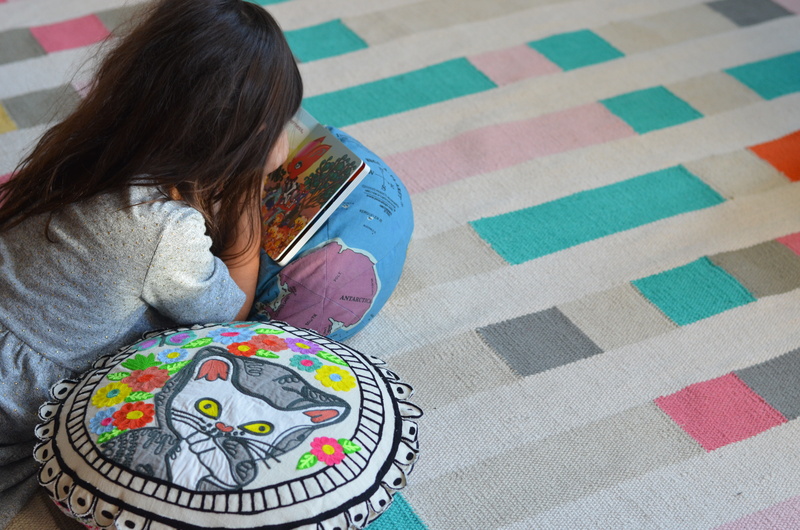 It’s amazing how a bright and colorful Land of Nod rug injects fun and whimsy into the front of our home. 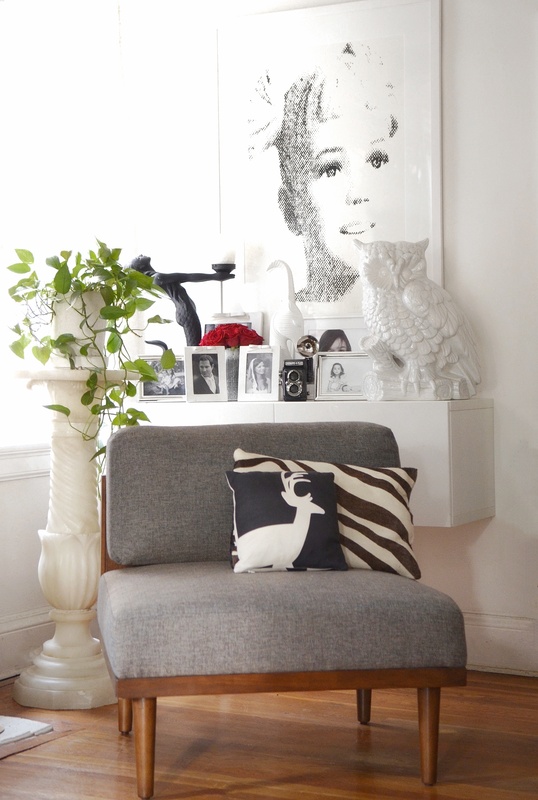 And small touches like garlands in window sills and fun throw pillows pull together the playful space. 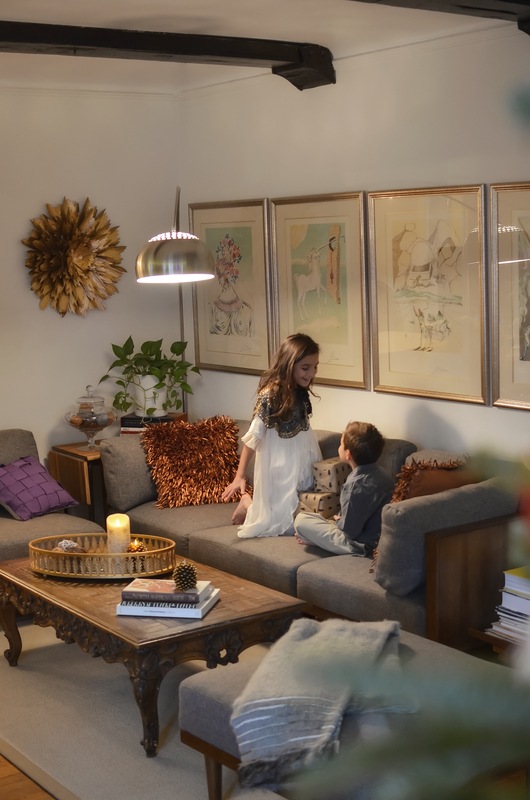 The Land of Nod’s furniture makes sense boasting clean and modern designs. 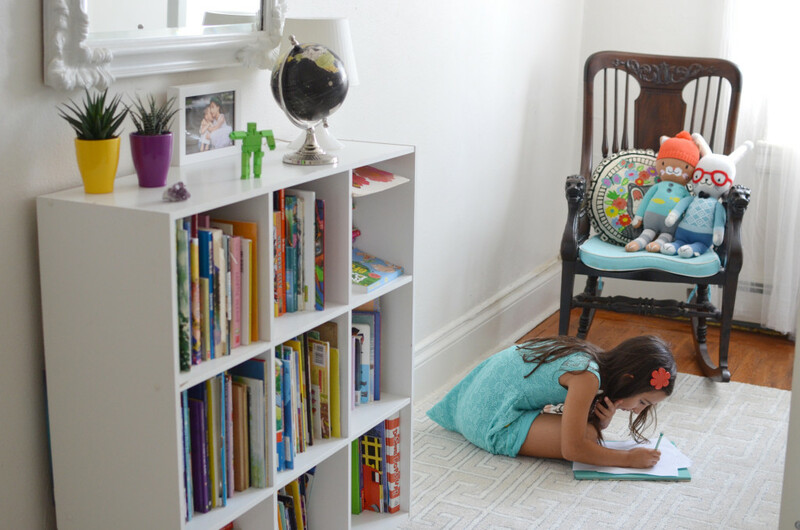 We love how the large drawer in the children’s table helps to centralize a homework station, and the smart acrylic protector keeps the furniture looking nice. Although our home rarely stays kept together as seen in these images. Functional storage helps to keep the Olympic-level toy explosions contained. 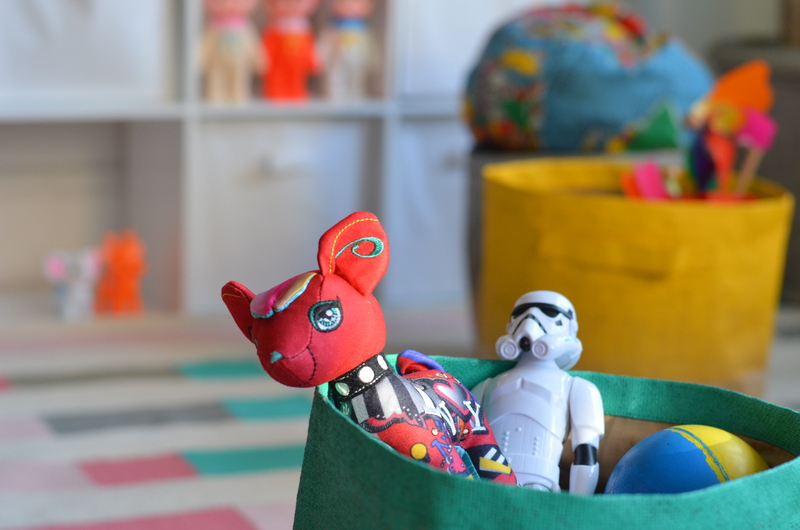 Current favorites live in the colorful toy storage dip top bins for easy access and clean up! We’re all so happy so happy with our little space. That inspires the minds of its occupants, both big and small. Special thank you to the Land of Nod for providing us with product. Opinions, as always, are my own.